Brian Buckley was born in Blackhill, Consett, County Durham, England in 1929. After graduating from the engineering program at Camborne School of Mines in 1950, he immigrated to Canada on the White Star Line ship Georgic, landing on May 26, 1951 at Pier 21 in Halifax, Nova Scotia. Buckley was hired by the International Nickel Company (Inco) in Sudbury, Ontario on June 7, 1951. 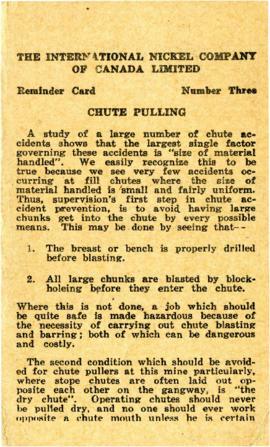 He worked on a timber crew, shaft-sinking, raise development and stope mining at the mine in Levack, Ontario. During his time in Levack, Buckley boarded at room 14, #2 bunkhouse which was run by Crawley & McCracken at the time. Buckley left the Levack Mine on March 26, 1952 to work in Engineering, Operations and Administration for Cominco Mines in British Columbia. In September 1974, Buckley was sent by his employer to Sudbury, Ontario to attend a three day mining convention. During this trip, he attended a tour of the Strathcona Mine and the Stobie Mine. In 1986, Brian Buckley retired and began working as an independent consultant on a gold mine project in Hedley, British Columbia. After three years, he finished the Hedley project and is now retired in Sardis, British Columbia. Records were donated by Brian Buckley in 2013. Fonds consists of photographs, an identification badge and various textual records.